The Belson Company has a full Professional Laundry Division which includes both the UniMac and Continental Equipment, and the US Chemical line of chemicals. We also offer parts and service with a professional team of the very best in the area. Extraction speeds up to 3 times faster than some machines mean shorter drying times, saving significantly on labor costs. Easy-to-use, intuitive controls streamline employee training and serves as a virtual laundry manager to ensure maximum labor efficiency. Save nearly three minutes on every rinse step with streamlined spray rinse that drains immediately, rather than performing the usual time-consuming bath-style rinse cycles. Get a 30-minute head start on the workday with our programmable delayed start feature. Lower Utility and Labor Costs - Our tumblers achieve the perfect balance between drying temperature, airflow pattern and usable cylinder space for maximum energy efficiency, shortening drying times - and reducing your utility and labor costs. Plus, an extra-large reversible steel door allows convenient and efficient access, while a self-cleaning lint filter eliminates the need to manually clean the filter after each use. 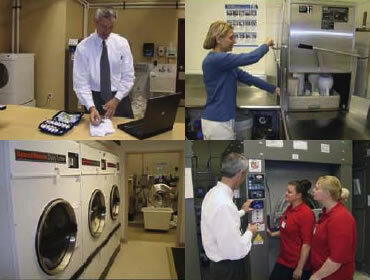 Not all on-premises laundries require large capacity washer-extractors and drying tumblers. UniMac's light commercial washers, dryers and stack units meet the needs of these facilities with the same reliability and efficiency of our larger models. 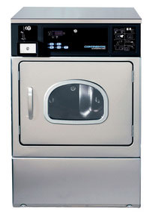 Our unique freestanding card and coin laundry washers and complementing commercial dryers deliver unsurpassed energy-efficiency, programmability, flexibility and 60-minute wash/dry customer convenience. Continental commercial washer extractors, dryers and ironers deliver unmatched performance, productivity and efficiency to fire departments, spas, hotels, healthcare facilities, rental companies, veterinary clinics, correctional facilities, B&Bs, dairy farms, athletic facilities, dry cleaners and industrial laundries. Commercial Ironers for On-Premise Laundries - In use across North America, Continental commercial Pro-Series Ironers are engineered to specifically fit the needs of on-premise laundries, dry cleaning plants and commercial laundries alike. They’re also used to boost profits at coin-op laundries offering wash-dry-fold and ironing services! All Pro-Series Ironers feature the exclusive Auto Speed System, allowing for one-pass finishing without dryer conditioning. Girbau Industrial finishing systems consist of feeders, ironers, folders and stackers designed to increase productivity while producing results that exceed the highest quality standards. For more than 40 years US Chemical has been a leader in the industry. No matter which laundry product it is, it’s manufactured to the highest standards.